Do you know what is fluxxing? Do not worry, it has nothing to do with a vacuum cleaner or homework. It’s a moment when all the ingredients come together in the right ratio and you are carrying a special and unexplained smile on the wave of fun. 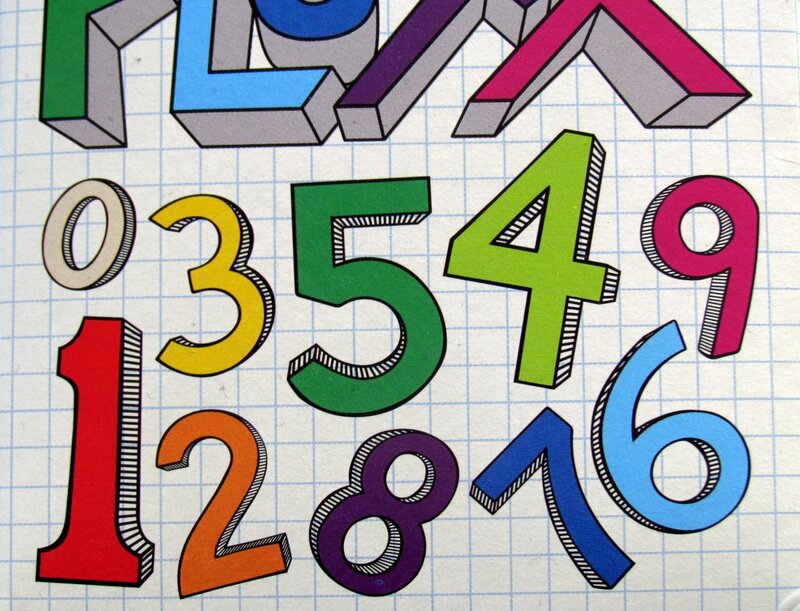 It’s synonymous with chaos and fun. And just for this experience, we invite you today to review of Chemistry Fluxx card game, which was prepared by Andrew Looney for all card game fans under the name of his small Looney Labs publishing company. 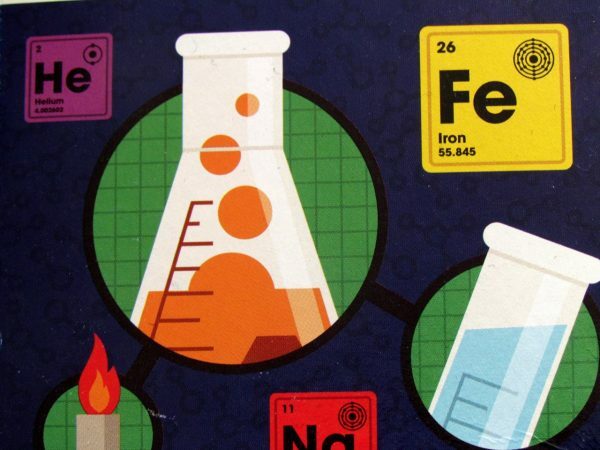 This is a novelty for year 2017, but there are also illustrations from traditional author Andrew Heath, this time on chemistry topic and its compounds. 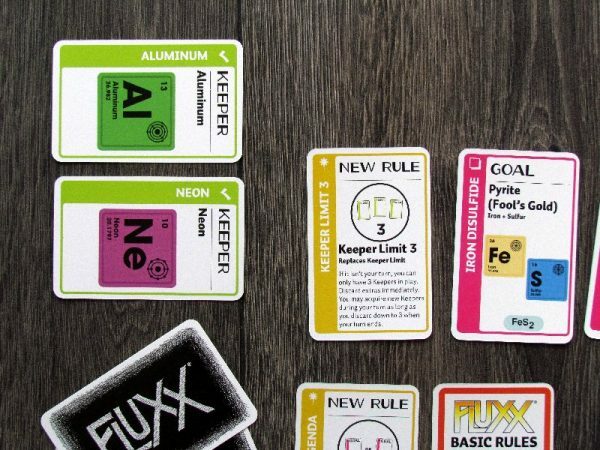 Whether you like chemistry or not, small cardboard box will surely lure you in with a variety of flasks, test tubes and incense. Inside, its not only about the rules, but there are also two piles of cards. Only two of them are different based on their back side and these are starting cards. 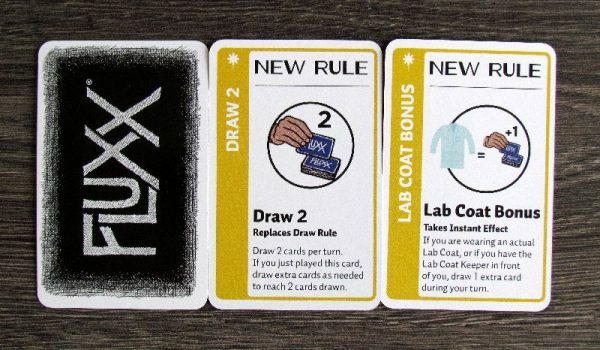 They once again describe the good old rule of Fluxx – draw one, play one. 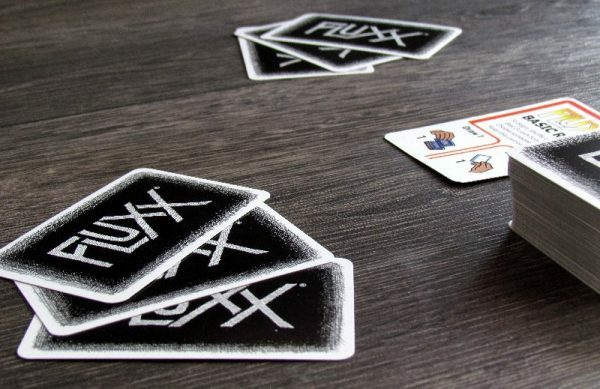 This card is placed in the center of the table and then each player receives three random cards from the shuffled deck. The rest remains lying in the middle for purposes of drawing. Among the cards dealt, player can get a lot of card types. 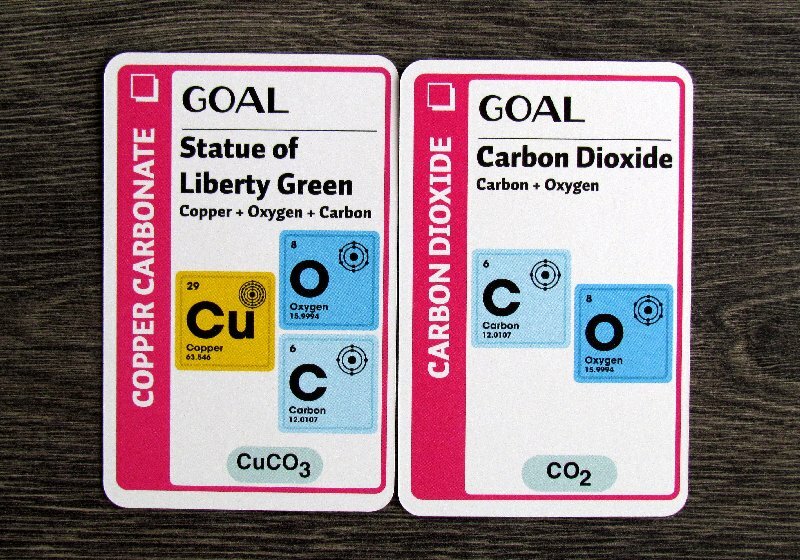 There are goals, that indicate a combination of two substances into one compound. This is the ultimate goal for each player. 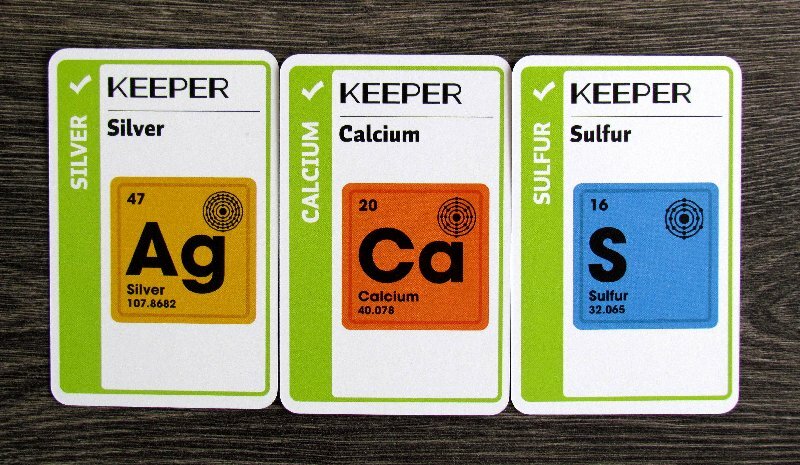 They use flasks in form of green keeper cards, they can play in front of them. 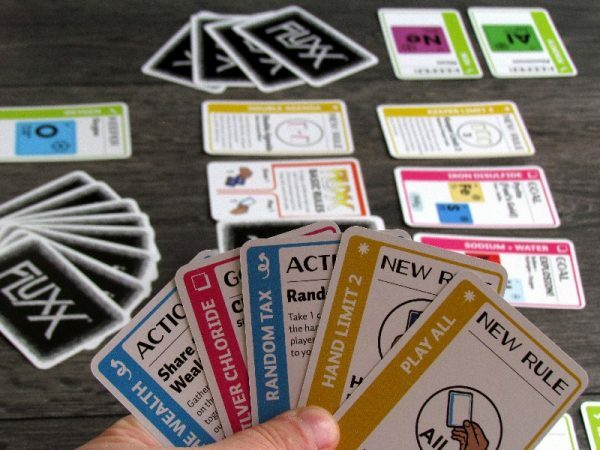 There are also action cards and new rules come to change gameplay. 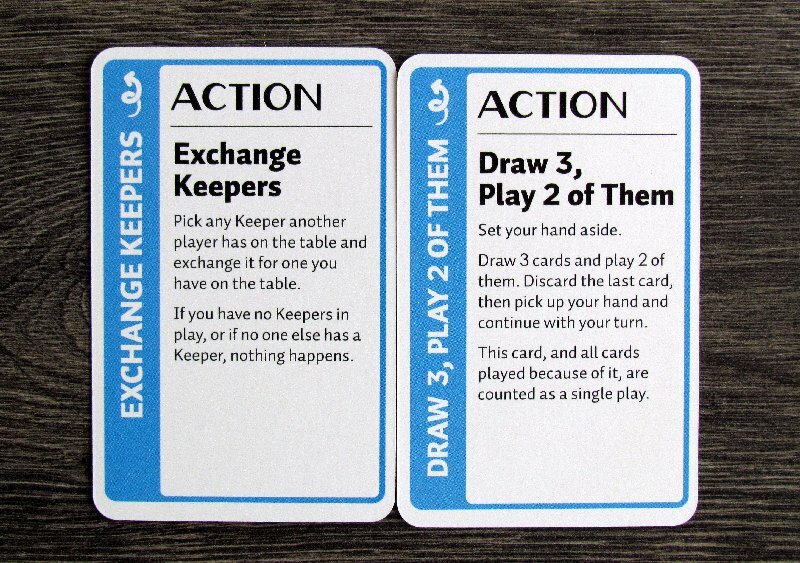 In each round, however, players first has to draw card from the common deck. At the beginning only one, but this can completely change with new rule cards played. This could mean, that even four new cards can be drawn at once. Then comes second phase, in which players uses cards from his hand (one or more, again based on rules). 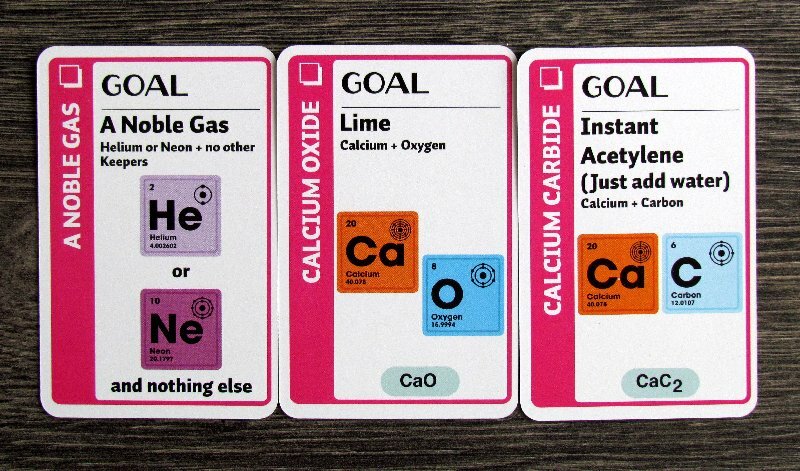 By doing this, he is replacing existing goal cards, playing keepers or adding new rules. That’s how the whole match is constantly changing. 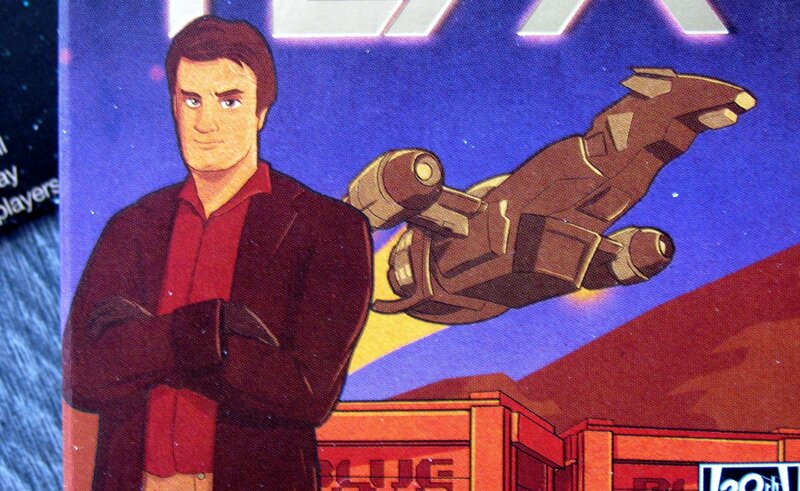 But in this game, there are absolutely no creepers. 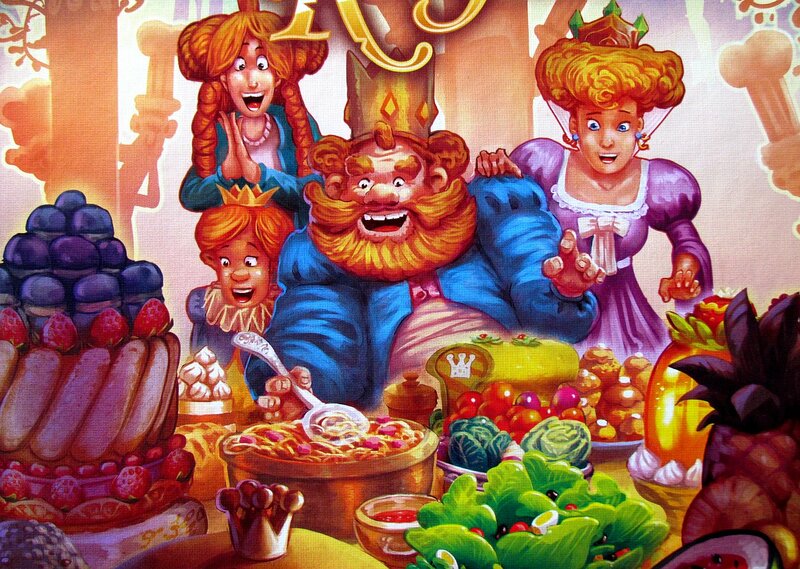 These are one of the trademarks of the game. 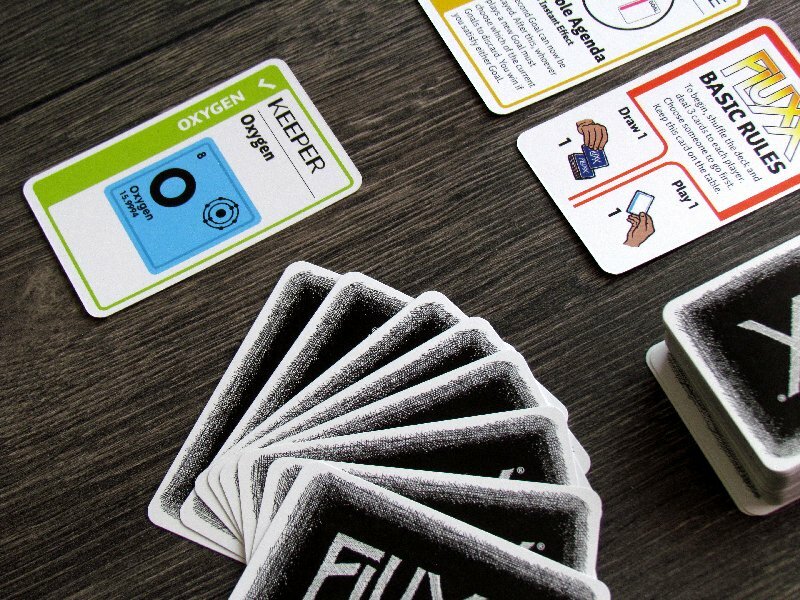 When player has one, it means, that he player cannot win. 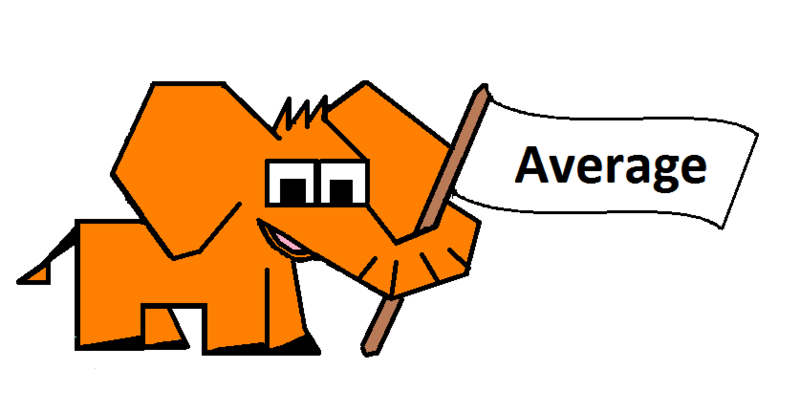 And since there are none, he may not be hindered by anything. He simply needs to collect a set of two elements on the actual goal card, have them in front of hime and he can immediately celebrate victory. 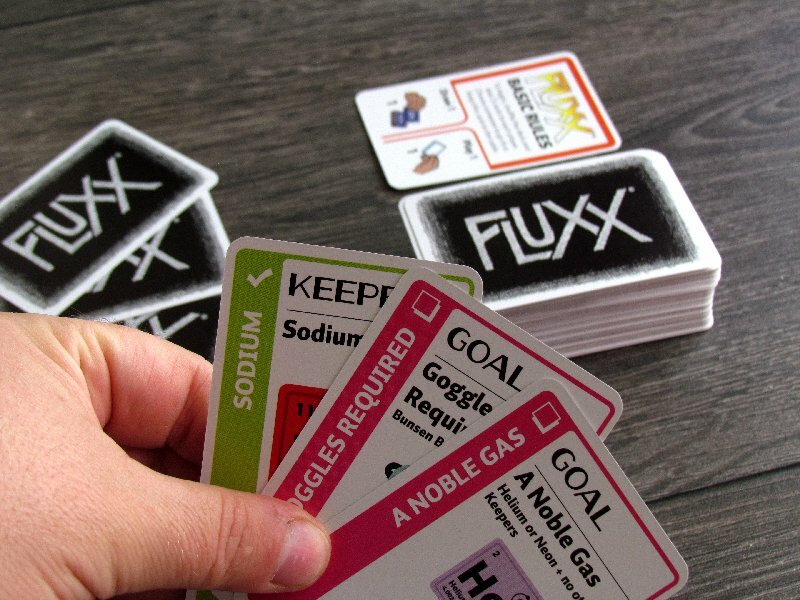 Chemistry Fluxx is a completely different game. 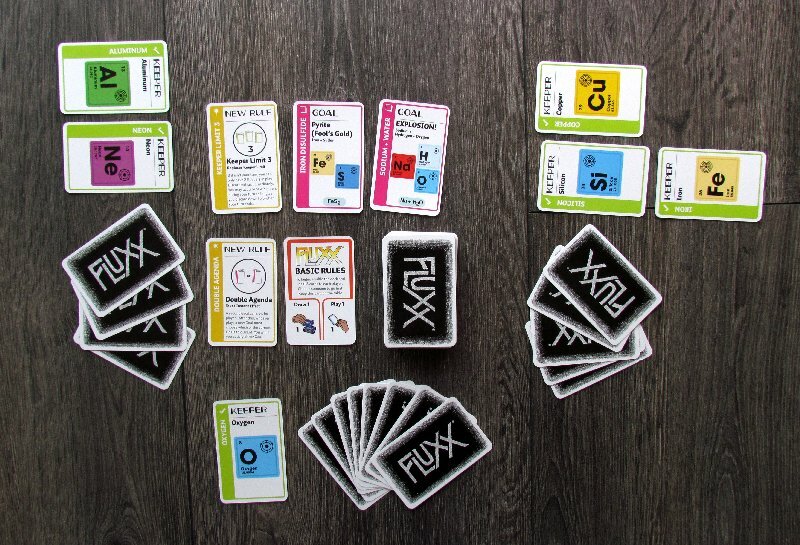 There are no elements to stop you from winning, as you are accustomed to other Fluxx games. 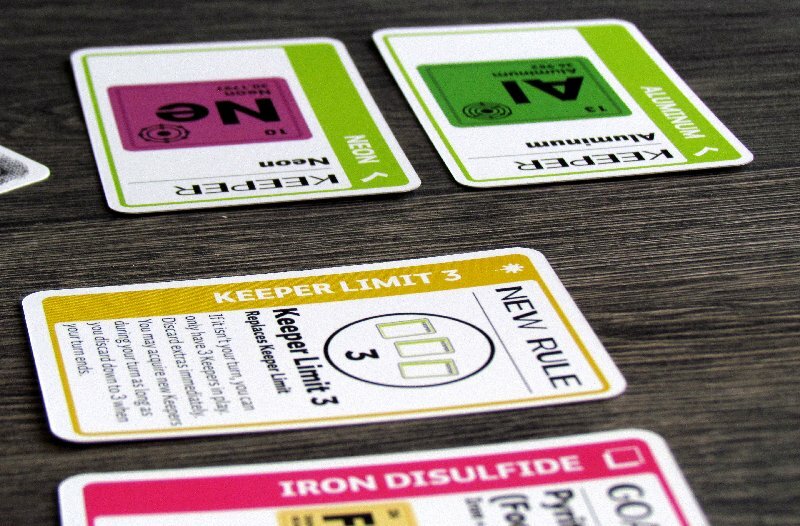 Players only affect the course with the help of rule cards and, of course, action cards. And there are some news among them. With the help of the Research an Element, a player can steal from his hand all the goals, that contain named element. 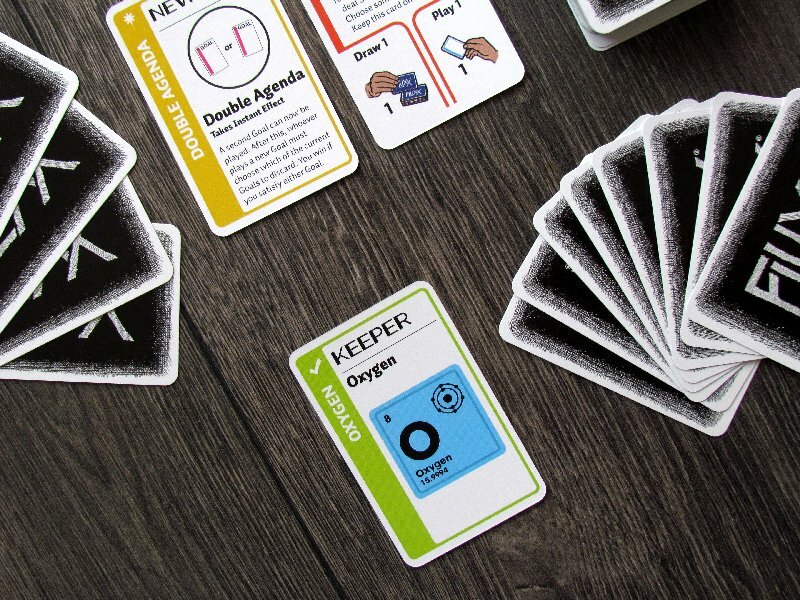 If this card is used smartly, you can get the final advantage and win. But there are new rules as well. 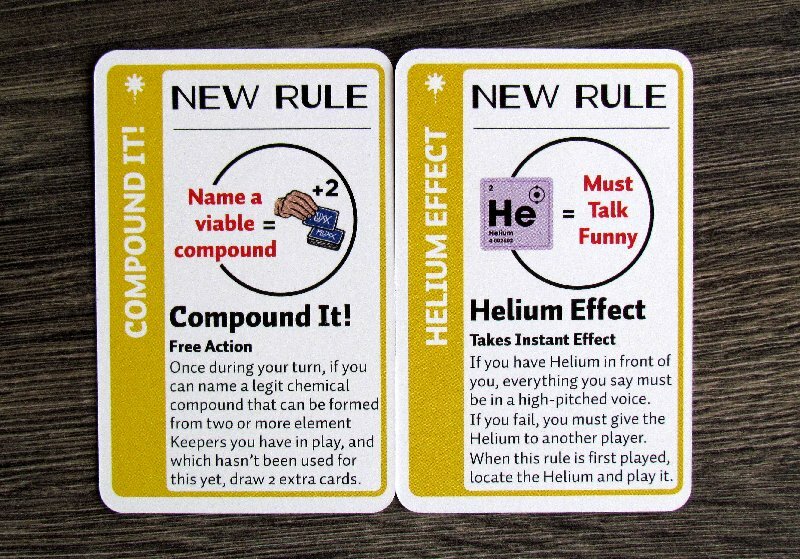 The lab coat owner gets one card extra, while due to helium, players have to speak in high tone (under threat of punishment). On the contrary, it is absolutely great, that goals themselves are equal to real compounds, whether salt, water or another familiar combination. And that’s what makes the game exceptional compared to the other Fluxx games. 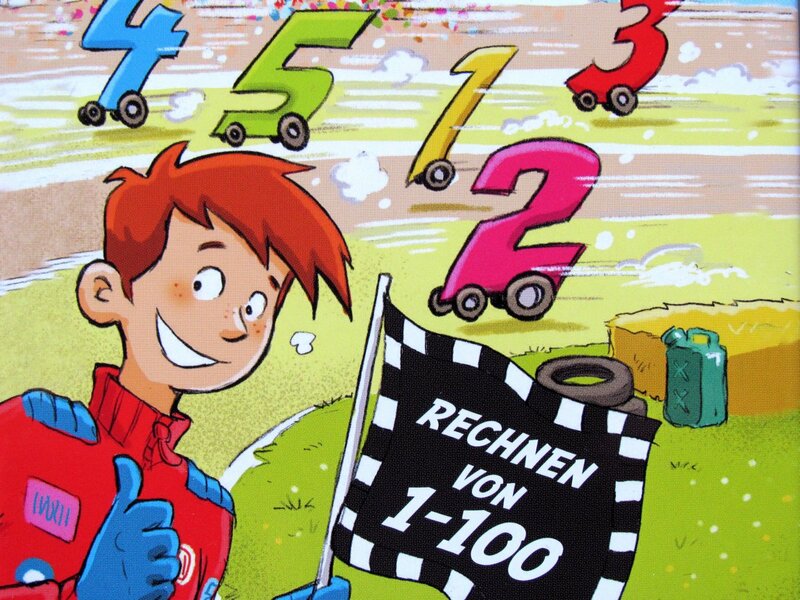 But what remains is lacking fun, is coincidencial and chaotic. 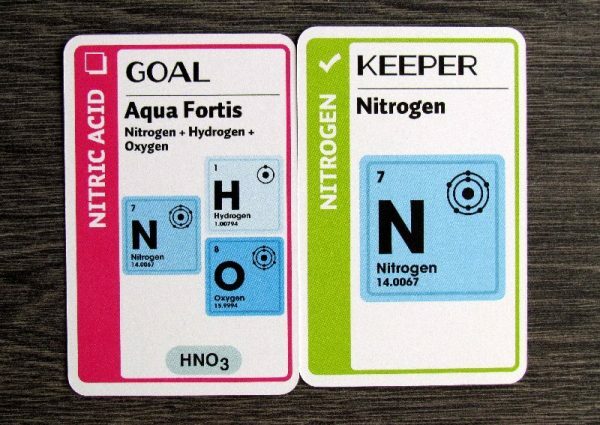 These two elements are the mainstones of the gameplay, that does well to one player and is disliked by others. And it remains like this even in this new box. Keepers have no special abilities and there are no other interesting surprise cards in the deck, that can respond to some unexpected situations. 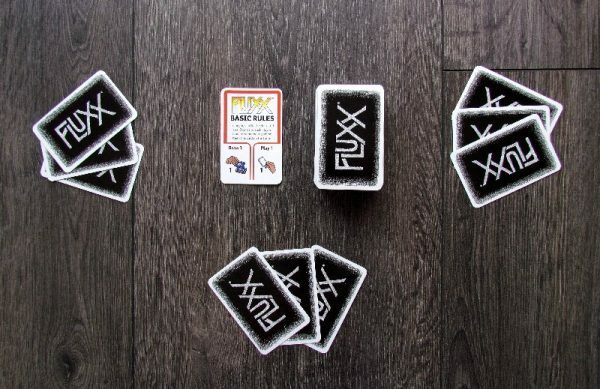 It was the only one possibility to react to the action of your opponent. Chemistry Fluxx is a solid pastime. 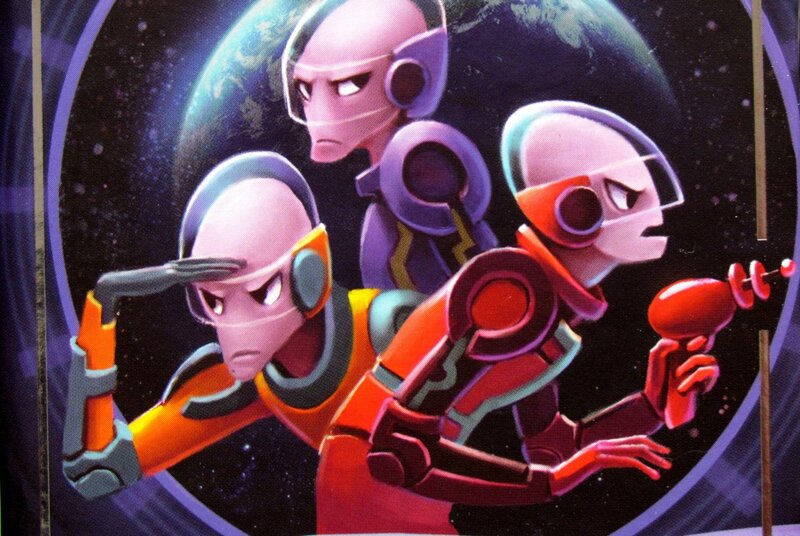 However, if you have experience with some of the older games in this series, then you probably will not be blown by this one. 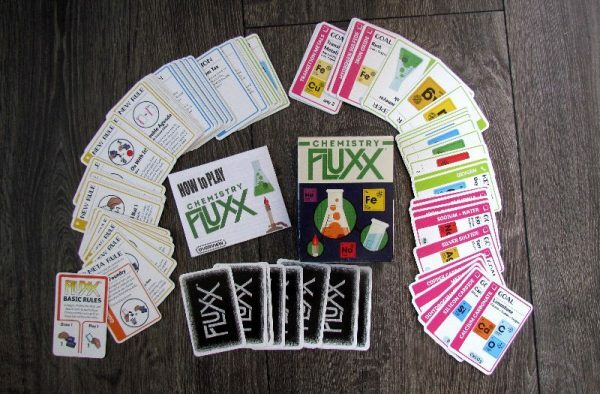 But if this was your first Fluxx or if you’re impressing with this theme, then Chemistry Fluxx will surely catch you as a good game. 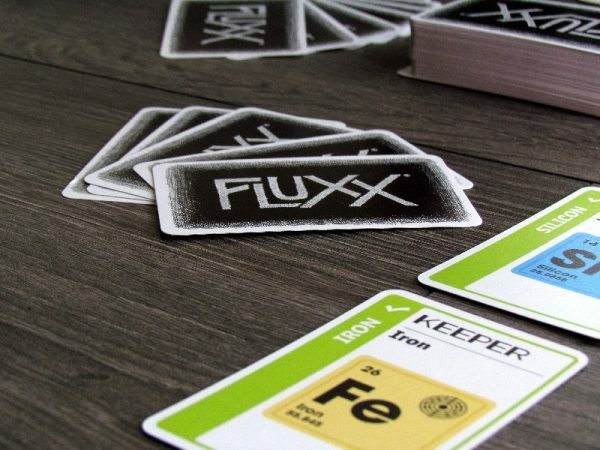 Chemistry Fluxx is all about chemistry, but it does not assume, that you will have a detailed periodic table of elements printed in your mind. 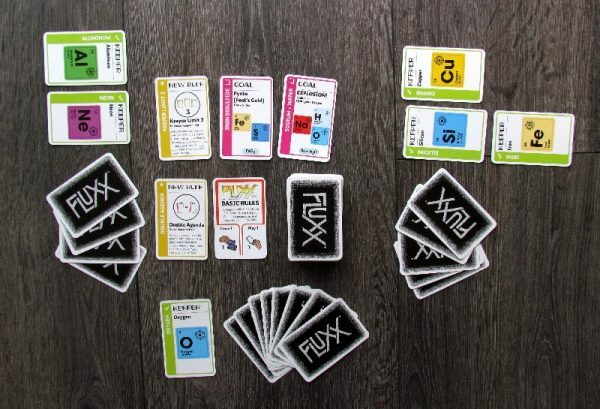 The game is built only around coincidence and light entertainment, which makes for very fast play. Compared to the classic Fluxx game, it does not offer creepers at all, which is a bit minus for overall gameplay. 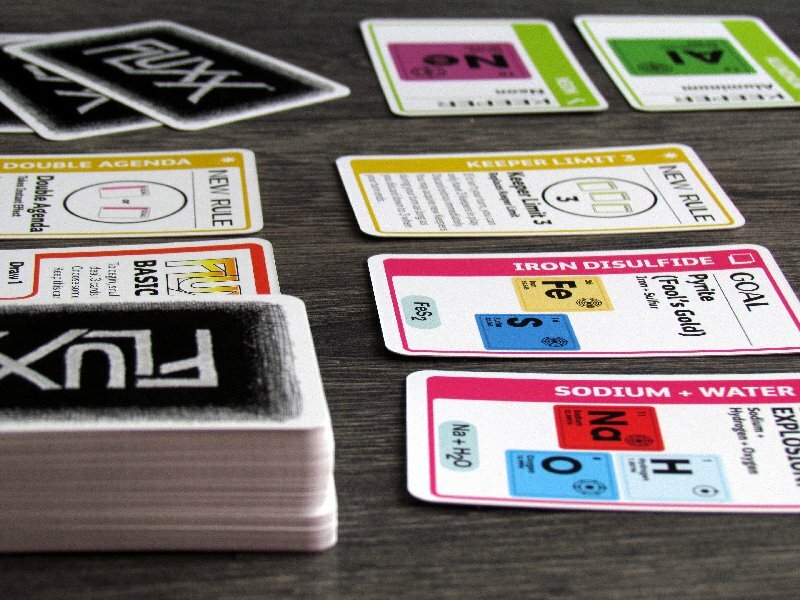 Chemistry Fluxx has disappointed us, but it still does not have to disappoint you, if you are new to its world.